Meguiar’s Quik Scratch Eraser Kit is the easy solution to removing light scratches, scuffs, defects, and more. Each kit comes with ScratchX 2.0, a microfiber towel, and a drill-mounted scratch eraser pad to help restore those minor problem areas. Meguiar’s ScratchX 2.0 is formulated for removing fine scratches and blemishes and is safe to use on all glossy paints. 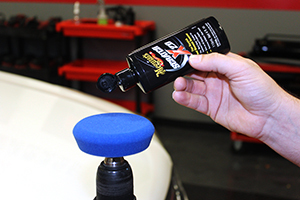 This non-aggressive solution helps remove paint transfer, fingernail marks, and paint defects from your vehicle when used with the Meguiar’s Quik Scratch Eraser Pad mounted onto your drill! Meguiar's Quik Scratch Eraser Kit is the easy way for removing all of those fine scratches and scuffs without a lot of elbow grease. This simple application will have your vehicle looking new again, in no time! 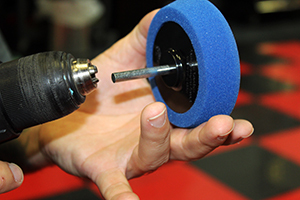 To use, apply a small amount of ScratchX 2.0 to the eraser pad, attached to your drill. Place the the Quik Scratch Eraser pad flat on the area in which you need to repair, turning the drill on to medium speed. 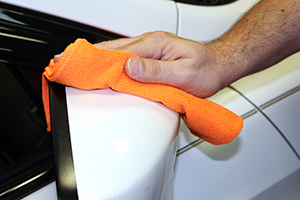 Make overlapping passes along area and then polish the area with the microfiber towel to remove any leftover residue. Follow up with Meguiar’s Ultimate Quik Wax to add protection to your vehicle!